I once heard one child say to another, as they passed my house on Halloween, "don't go there, they always give out raisins." Ouch. I LIKE raisins, but I guess I'm living in an alternate universe, and Halloween requires better treats. So for a couple of years I gave in and just bought bags of "regular" candy. But I couldn't keep up that kind of nonsense. Then I found treat bags of pretzels and the kids seemed pleased with those, but the cute bags of pretzels are hard to come by, so here's what we're offering tonight to the trick-or-treaters, should any appear. 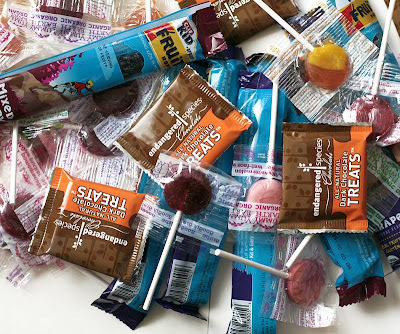 There are Endangered Species Chocolates, Clif Kids Fruit Ropes and Yummy Earth Organic Lollipops. All of which will be welcome at our house should there be any leftovers! For your treat, I'm giving you this video. It's pretty remarkable, and I hope you like it. This is my final mofo post for 2011, one of 22. 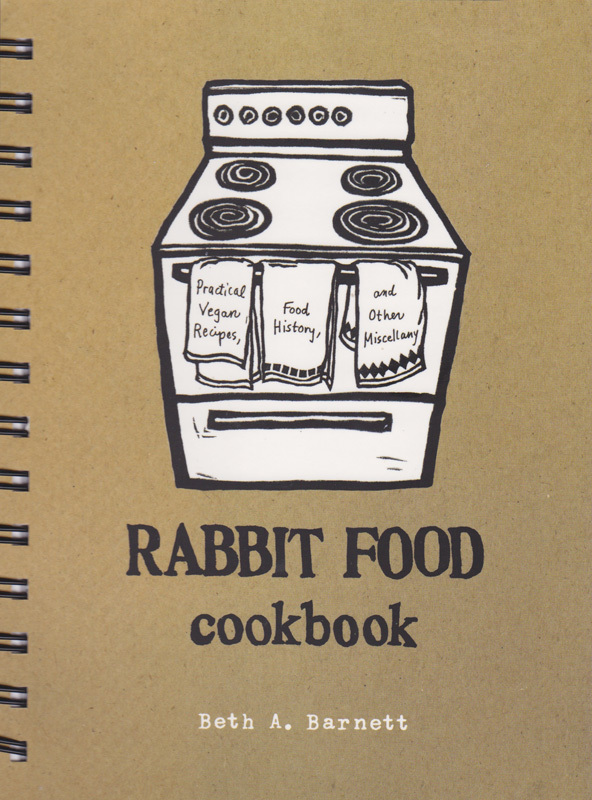 Don't forget to enter to win the Rabbit Food Cookbook on post 21! 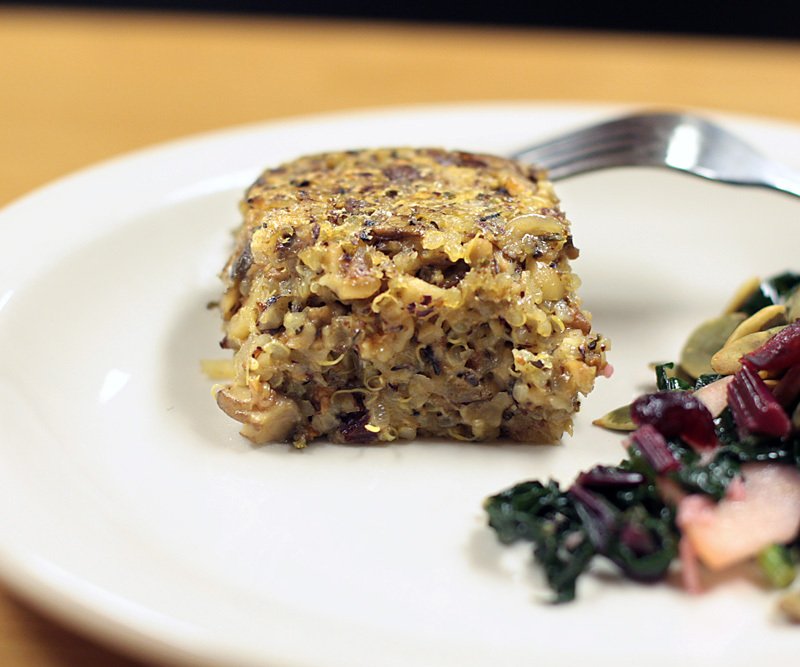 And to also check the other blogs on the Rabbit Food Cookbook virtual book tour. When I was asked if I'd like to participate in a virtual book tour for Beth Barnett's Rabbit Food Cookbook, of course I said yes. Although I don't consider myself a rabbit, I do have a cookbook collection that requires frequent feeding, and seems to multiply like rabbits. In exchange for my review, I got another cookbook to add to my collection, and a deadline of today, which is good, because although I'm mildly addicted to acquiring cookbooks, I'm not particularly compelled to use them. If you know what I mean. If you've been following the tour, you probably already know all about the cookbook and wish you could have one, too. Well, maybe you can, if you live in the U.S. or Canada. After reading the review, leave a comment mentioning what most attracts you to the book, or just leave a comment about anything, if you prefer. On Friday, Nov. 4, I'll randomly select a cookbook winner from all the commentators, and it may be you! Be sure your comment links back to an email address where you can be reached. The book's handy size (5-1/2 by 7-1/2) and spiral binding, make it a pleasure to use, and the winsome illustrations add to the fun, but there's serious information inside the 223 page volume. Barnett provides excellent background information on why choosing a plant-based diet may be optimal for both us, and the planet. From The Food Supply in Perspective, to Health and Nutrition Considerations, to The Industrialization of Food in America, she's got it covered. There's even a section on how to prepare and maintain a garden, as well as instructions for making shopping and produce bags. Add Ingredient Tips, Essential Equipment and Measurements, and you've got plenty of useful advice to help you make the most of the recipes. Most of the recipes seem like the kind of tasty, everyday dishes that can be whipped up pretty easily without a lot of time or exotic ingredients. You'll find recipes for every meal — Waffles, Crumbly Coffee Cake, Crunchy Broccoli Salad, Balsamic Veggies and Potatoes, Seitan Walnut Quinoa, Tofu Knishes, Pasta With White Beans and Special Chocolate Cake — to name just a few of the 90 choices. 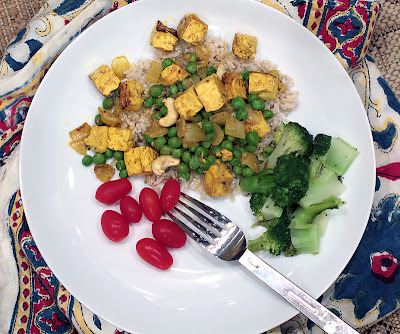 I chose to taste test Curry Tofu & Peas, because I happened to have all the ingredients on hand, and because another reviewer beat me to making Chickpea Masala. I added the optional coconut milk but was sorry — the flavors were more intense before I added it, and it didn't seem to add anything to the dish. I'd definitely leave it out next time. I added the cashews, too, but left them whole. 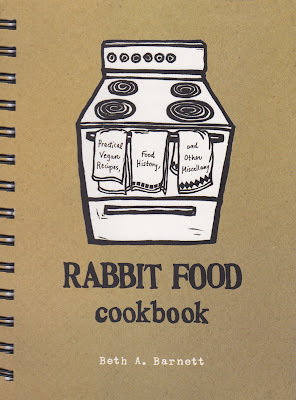 Full disclosure: A review copy of Rabbit Food Cookbook was provided to me free of charge by Sasquatch Books, Seattle. I was not paid to write a review, nor was I threatened with bodily harm if I didn't write one. They're so good, but is there anything in those rice sticks? Yesterday I posted photos of the fast dinners I enjoyed the two previous evenings, and here is last night's variation. 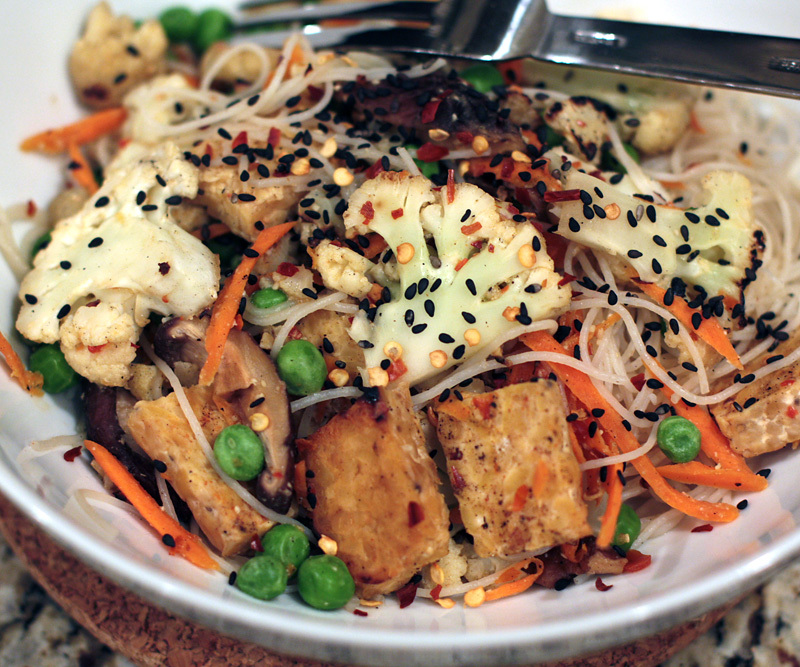 This one-bowl meal contained tempeh, cauliflower, carrots, peas, and dried shiitake mushrooms, with a black sesame seed garnish. I used the broth from soaking the mushrooms to make a miso-mustard sauce,* and once again, served the tempeh and veggies over rice stick noodles. This dish took a little longer to make than the other two — probably because the carrot needed peeling and grating, the mushrooms needed soaking, and, even though it was a long time ago, I'm still not fully recovered from the black worm incident. I know, I'm unreasonably squeamish, but I spent a long time inspecting every little black thing before I could slice the mushrooms. 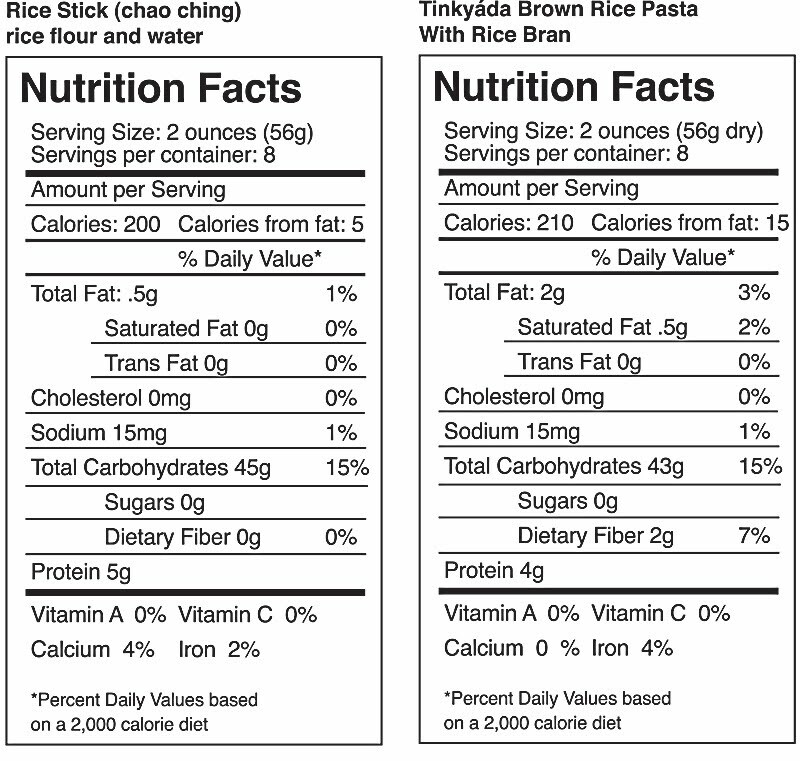 All four foods are low in salt, fat and sugar, similar in total carbohydrates, and gluten-free (though the brown rice and rice sticks don't state that on the label). None are particularly high sources of protein by themselves, but with added protein such as tofu, tempeh, beans, nuts or seeds, would be fine. I don't really worry about protein anyway. 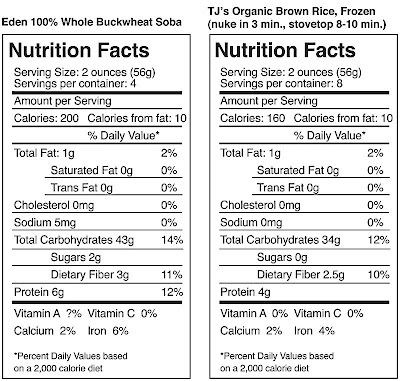 The fiber ranges from zero in the rice noodles to 3g in the soba. 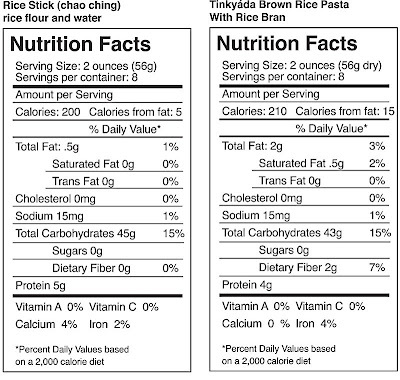 The calories range from 160 for the brown rice to 210 for the Tinkyada — not a big enough difference to sway my choice. Now that I've done my homework, will I change my choices? 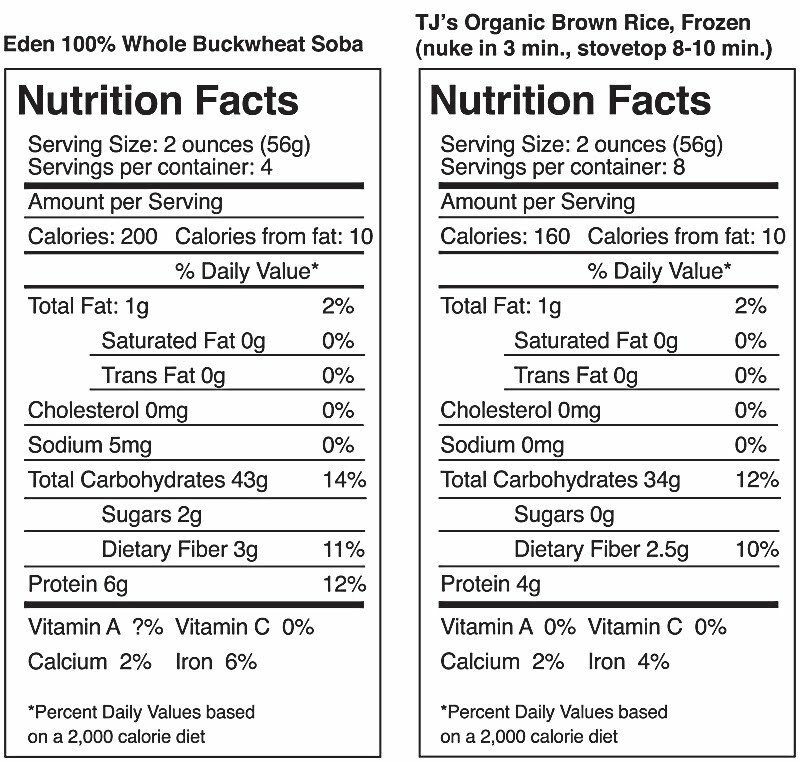 The total lack of fiber in the rice sticks concerns me a little, but probably not, though maybe I should opt for the buckwheat soba or the brown rice more often than the rice sticks — variety is probably the key. What do you think? Note: *When I looked at my comments this morning, I saw that blessedmama had left a note that when she gets to the "nothing to eat" stage she's usually looking at mustard and miso. That gave me a laugh, since it's exactly what I used for last night's sauce! My theme this week is supposed to be videos depicting the sensitivities of animals, and the relationships we humans have with them. Here's a video of a rescued cow being reunited with her baby. The humans aid in the reunion, but not as companions to the cow and her babe. 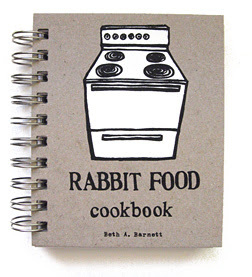 You may have noticed the Rabbit Food Cookbook blog tour happening this week on a blog near you. The "tour" officially started Monday, and will hit this blog on Oct. 30, with a review of The Rabbit Food Cookbook, and a giveaway. Here is a schedule so you can follow along during the week—hopefully discovering some great new blogs, and entering giveaways to win a copy of the book! I haven't been cooking a lot lately — or maybe I should say I haven't been cooking carefully followed recipes or composed dishes. It's been more "get-'er done" cooking, which isn't to say it hasn't been relatively healthy or tasty — just fast, and without much pre-planning. Someone once told me I should post these dinners, so here are images from the last two nights. Above is one of my favorite fast meals. 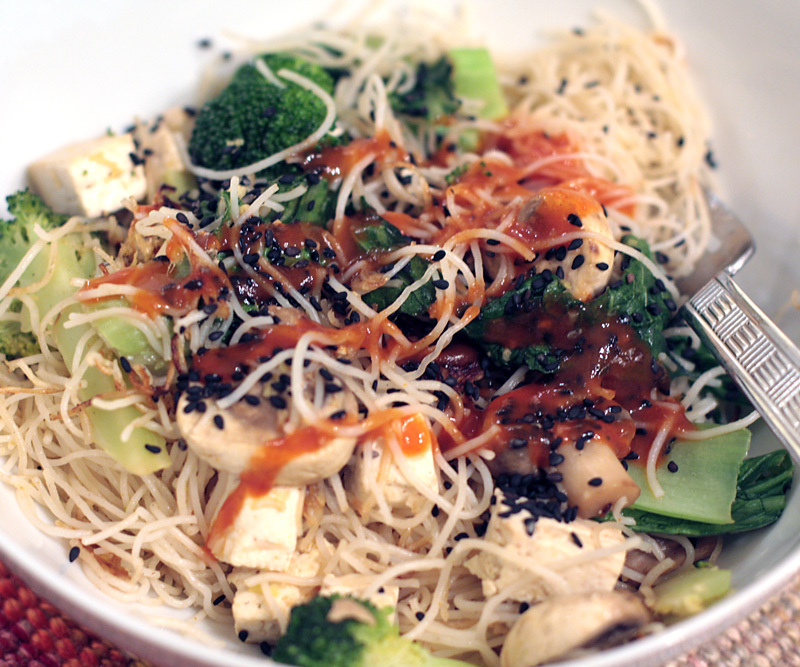 It basically consists of Asian rice noodles, which I love for their taste, texture and speed of cooking, tofu, and whatever veggies I have on hand — in this case, broccoli, bok choy and mushrooms. The topping is black sesame seeds and shriacha. (I used Shark brand sriracha, which I've heard is most like the traditional sriracha used in Thailand, and unlike Rooster brand, it contains no preservatives. It's a little sweet for my taste but I use it anyway.) This meal in a bowl made me very full and happy. 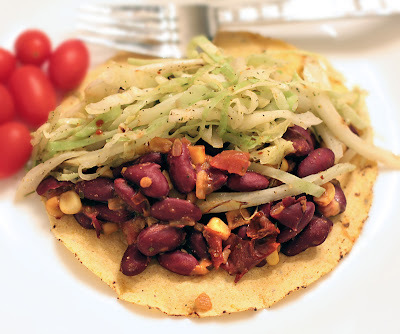 Last night's dinner was a soft corn tortilla warmed in the wok, and filled with kidney beans and lightly sautéed cabbage. 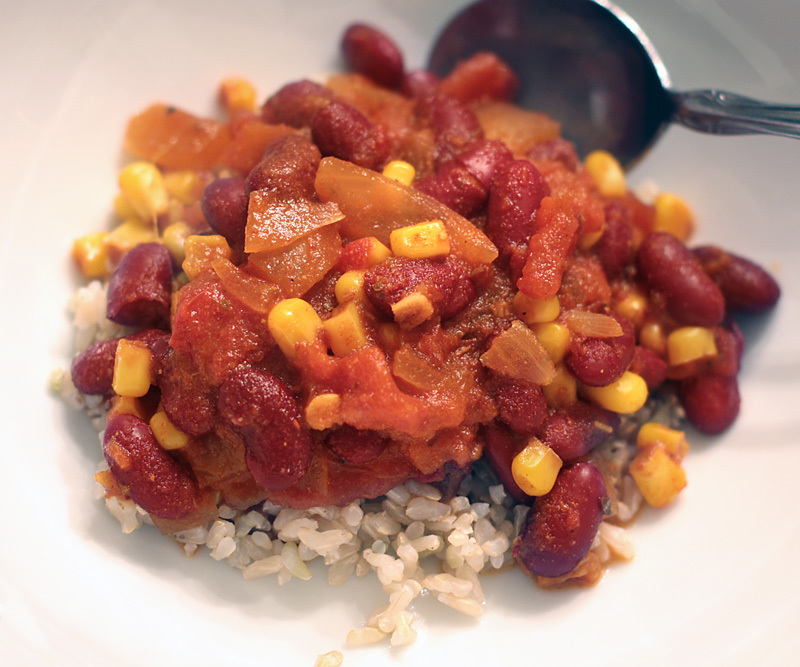 The beans were from a can, and chipotle in adobo and frozen corn were added to the pot as they heated. Also added were oregano and chili powder. And jarred Food for Lovers vegan queso. This turned out to be really good, and I overate. Tsk. I have a cat friend. She (I assume she's a she) comes to visit occasionally, and if I happen to be home and see her sitting outside the glass door from the deck to the kitchen, I invite her in for a snack and a cuddle. I have no idea who she is or where she lives, but she seems healthy, well-fed and in good condition. She doesn't have a collar with ID. Personally, for many reasons I won't go into here, I believe that city cats should be house cats. I don't buy into the "cats should be free to roam" theory. All of my cats, even the one I rescued, covered in ice on a winter day, became contented house cats. I've known too many cats, both city and country cats, who died under the wheels of a car, disappeared, or became ill while they were "free." And there are birds to consider. I'm a sucker for tender portrayals of people and animals — especially kids and loving, devoted dogs. Can you watch this and not shed a tear? 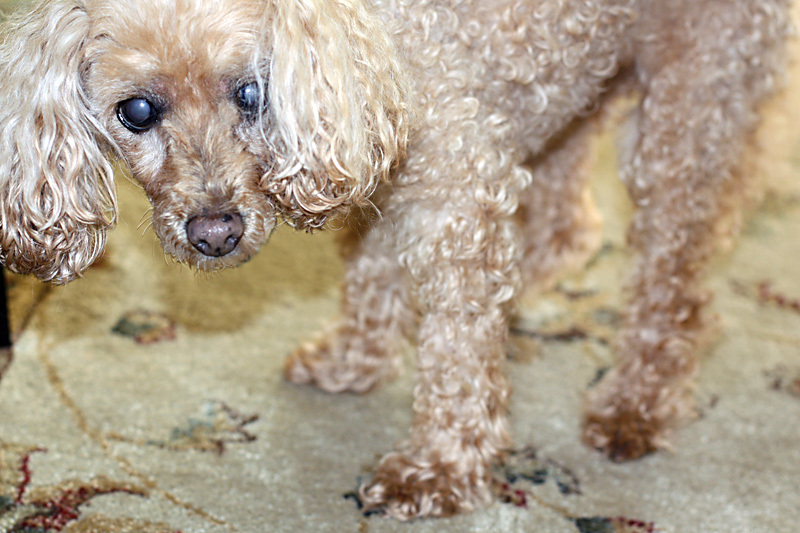 Who can resist Betty White looking for "ways" to increase her pooch's chances of winning a contest? This is a real contest, by the way, that anyone can enter to have their dog on the cover of an Orvis catalog. The prize also includes a $500 gift certificate to Orvis. In conjunction with the contest, Orvis is donating funds to the Morris Animal Foundation's efforts to fight, treat and cure canine cancer. Betty White is a trustee of the organization. I think she is a vegetarian, and might possibly be a vegan. You can enter the contest here, but even if you don't want to enter, or don't have a dog, you should watch the hilarious Betty White do her thing. I can't groom her until all her wounds are healed and the stitches are out, and the last time I tried to brush her ears, she cried, so of course I stopped right away. 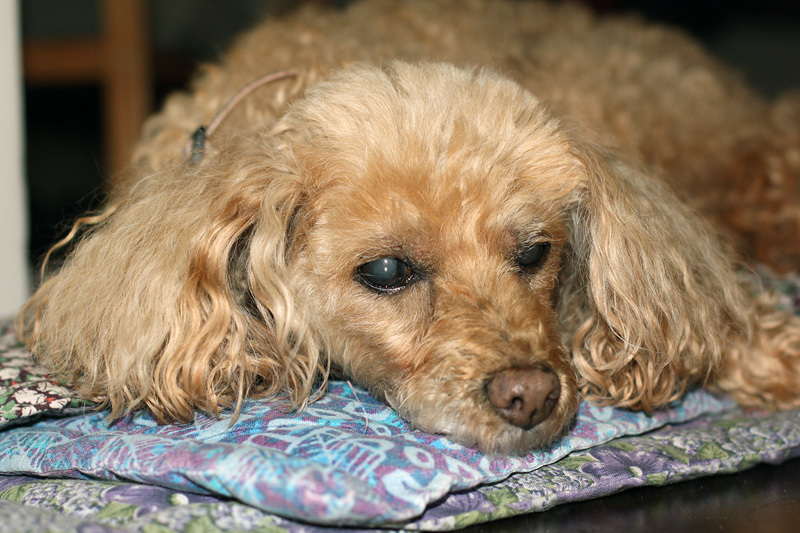 Maybe sweet little Buffy can win the judges hearts with her sad story of being attacked by another dog while staying at a dog-care home. 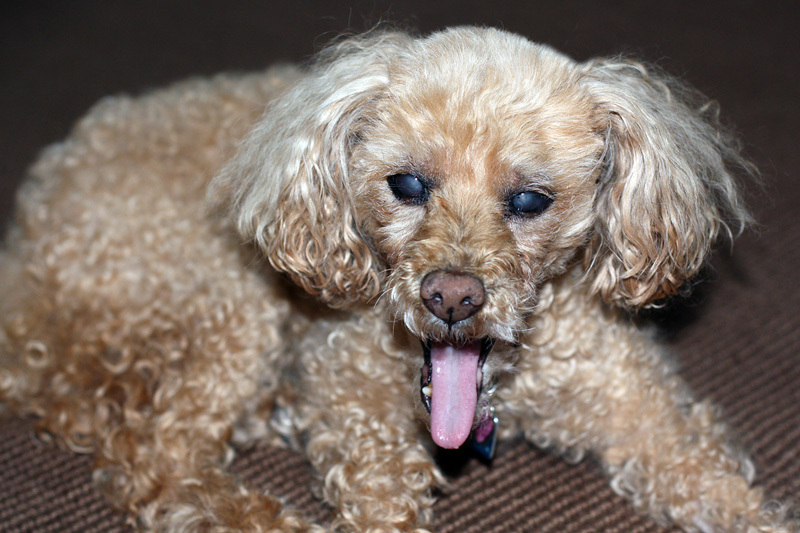 "Do what you want," says Buffy. "I'm tired." Here we are in the final week of mofo, and so far I've managed to stick to a weekly theme, and post every weekday. My theme this week, should I choose to follow it, is stories and videos about animal-human interactions. And I will get to that, in a way, before I finish today's post, but not in the way I originally planned. So what, right? Sometime things don't go as planned. Until two years ago, I never lived in a house with a microwave — by choice. There was one at work that I sometimes used, but my cooking was basically done on a stove or in an oven. I was a little afraid of the effect of microwaves on food energy — and on me. When we moved to Seattle, the rental house had a microwave, and I used it sometimes to reheat food, but I rarely cooked anything in it. Occasionally I'd experiment with potatoes or cupcakes, but not very often. The house we bought has a microwave, too, and I find myself using it more often because it does things like cook a potato in five minutes so I can use it in a recipe, or make oatmeal in a bowl — no pot needed. 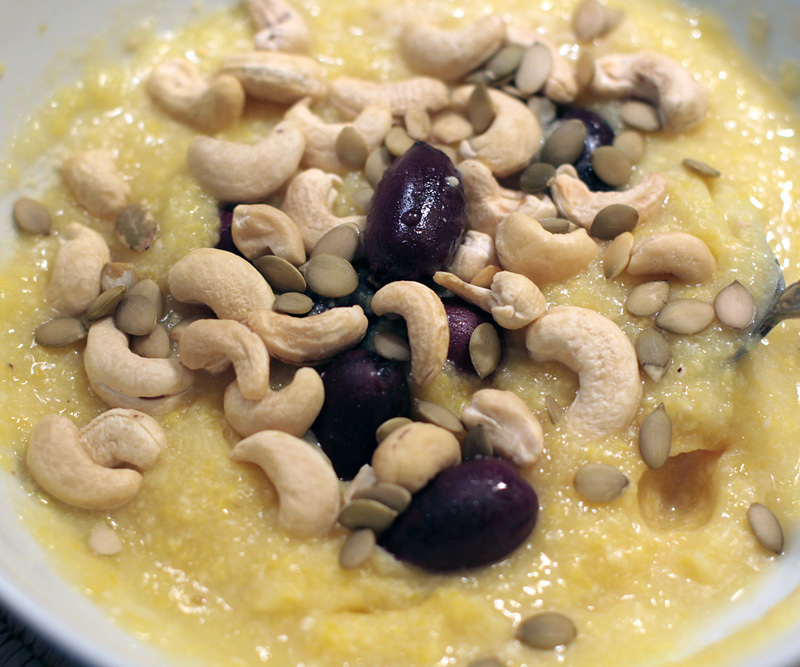 Recently I discovered I can cook polenta in five minutes and have it for breakfast. I use 1/4 cup of coarse polenta, some nooch, a few grains of kosher pink salt and 1 cup of water. Put the ingredients into an over-sized bowl, stir, and cook for five minutes for a soft, creamy breakfast cereal. After it's cooked, I embellish it with raw pumpkin seeds, and maybe dried fruit, or as I did today, raw cashews, pumpkin seeds and calamata olives. (I use an over-sized bowl so the cereal won't splatter the oven.) Do you have any qualms about microwave cooking? Photographed next to the front door. 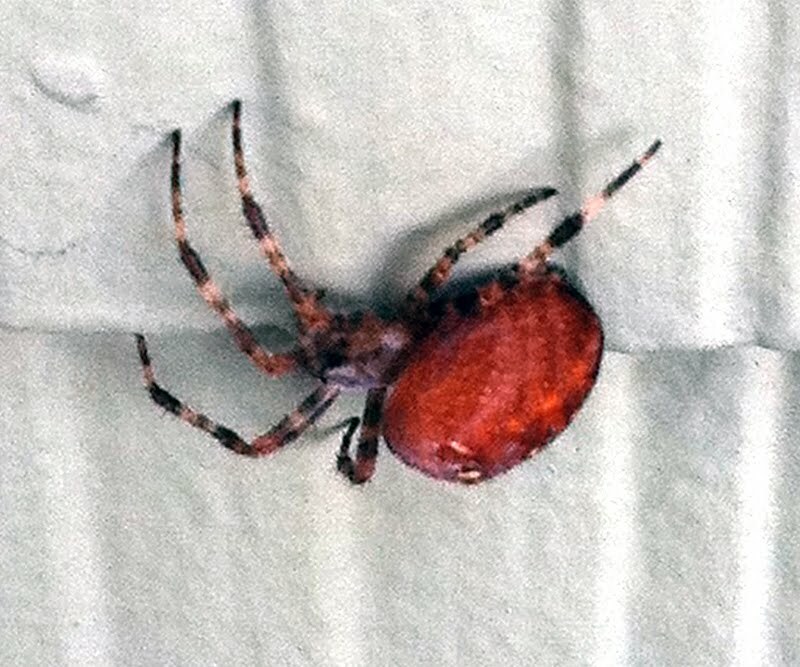 The round body part is about 1/2" in diameter. I'm not sure this qualifies as a heartwarming animal story, but I'm about to give you some very useful information. 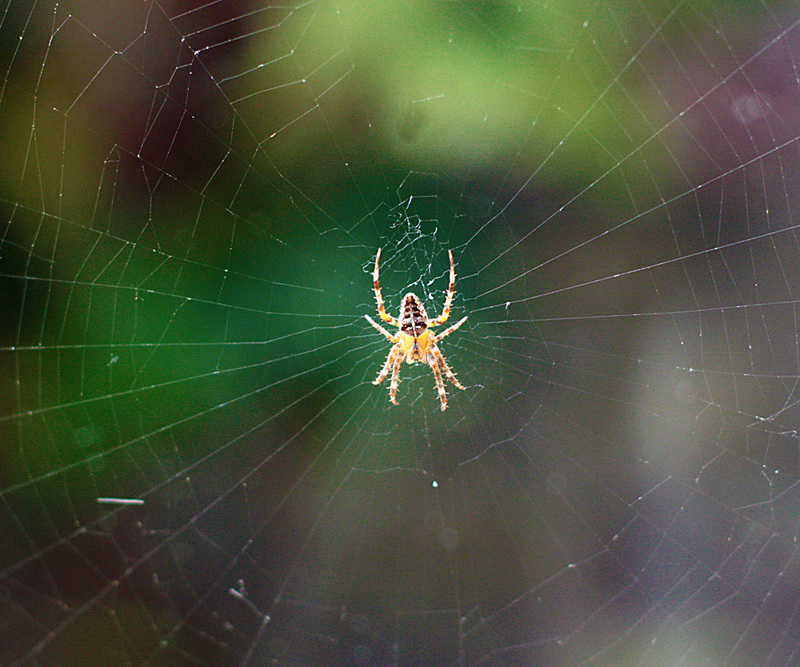 Did you know a spider can set off a smoke alarm? Neither did I until the wee hours of Sunday morning when our piercingly loud alarms went off. There was no smoke and no sign of fire anywhere. Outside the dining room window. When the alarm was removed from the ceiling, a small spider fell out, and subsequent searching on the Internet revealed that smoke alarms should be cleaned regularly with compressed air to remove dust and spiders, because, duh, they can cause the alarms to malfunction. 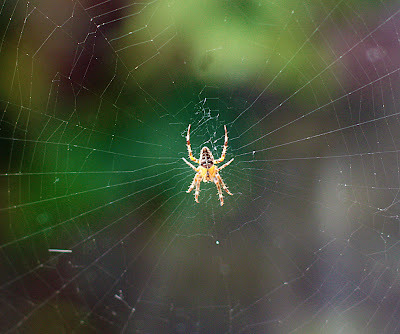 Why a smoke alarm will mistake a spider or dust for smoke is confusing to me, but trust me, it can. It worries me a little that my first reaction to the smoke alarm isn't to vacate the premises, it's to make it stop. I suppose if we smelled smoke or felt any danger we'd get out and call 911 — at least I hope so. 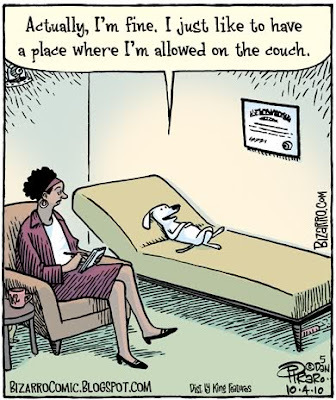 In lieu of a heartwarming animal story, I leave you with this, though I'm sure all of your dogs and kitties are allowed on the couch. 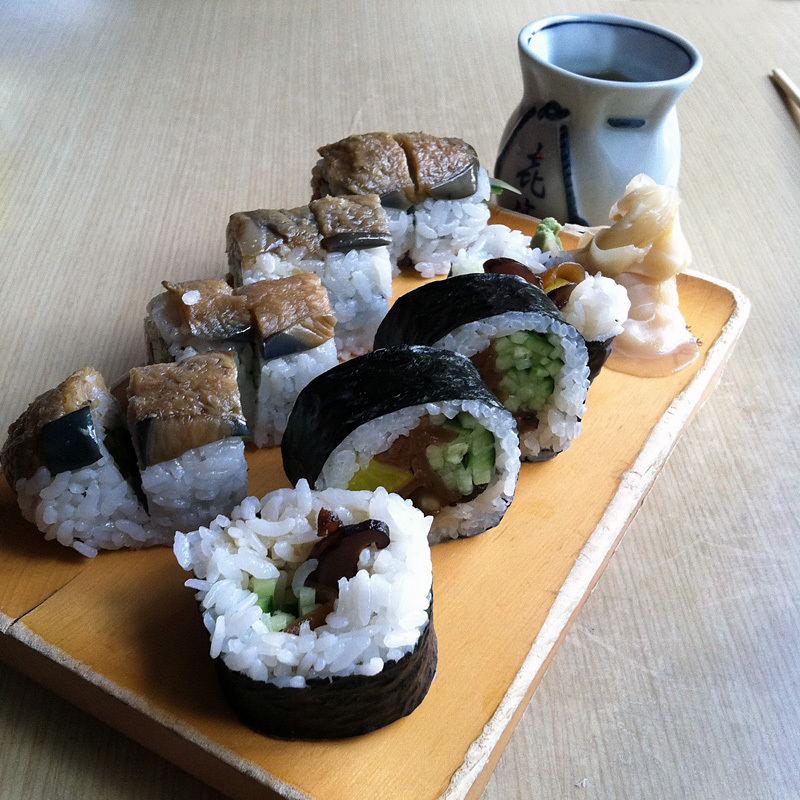 Bethany's vegetable sushi and eggplant sushi, hold the egg. The first time I ate at Kisaku, in Seattle's Tangletown neighborhood, I carefully ordered vegan sushi, and was surprised when the waitress brought me miso soup too, because it doesn't say anything about soup on the menu. The soup smelled like bonito flakes, and when I inquired, I was told that, yes, it contained the fish flakes. When I asked if I could have soup without fish, I was told no, so I politely declined the soup, and decided not to go back there again. Everyone around me was enjoying soup, and it didn't seem fair to pay the same price but not get soup. Not fair. Not fair. I was annoyed that they couldn't make miso soup without fish flakes. The thing is, Kisaku is walking distance to my house, and such a beautiful place to eat, that I recently gave it another chance. YES! This time I could order the soup without fish. Yay. 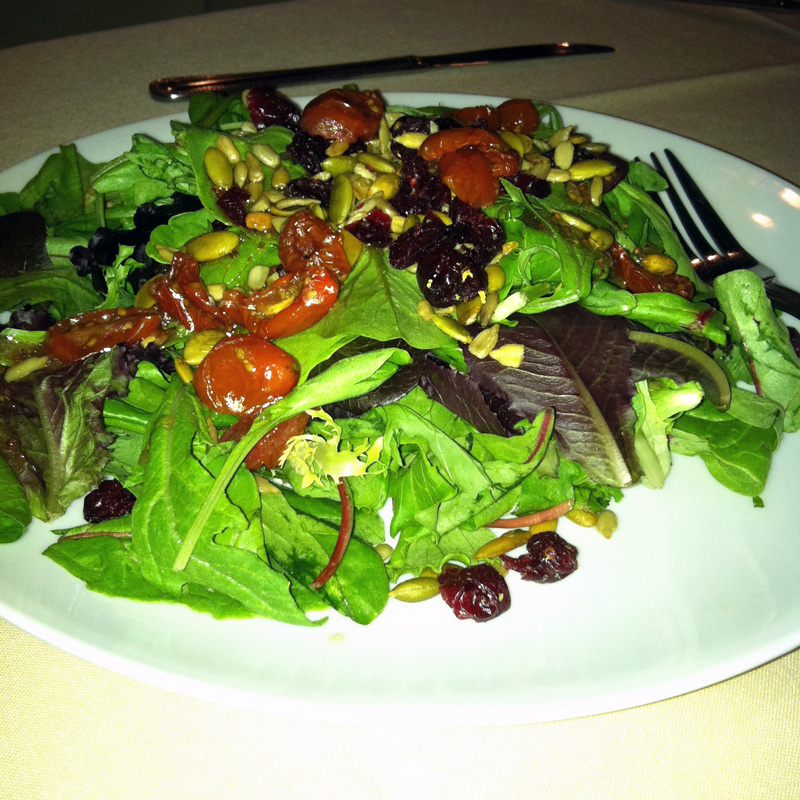 And there was also an excellent salad that I didn't remember. The soup and salad come with anything you order. I ordered vegetable curry, which according to the menu, is flash fried assorted vegetables in curry sauce on a bed of rice, and contains no animals, so they say. Granted, it's the only vegan listing on the menu, but it's so delicious, with the creamy eggplant, crispy broccoli and other perfectly cooked veggies in a rich, fragrant curry sauce, I'm happy to keep ordering it. And I have — at least three times. 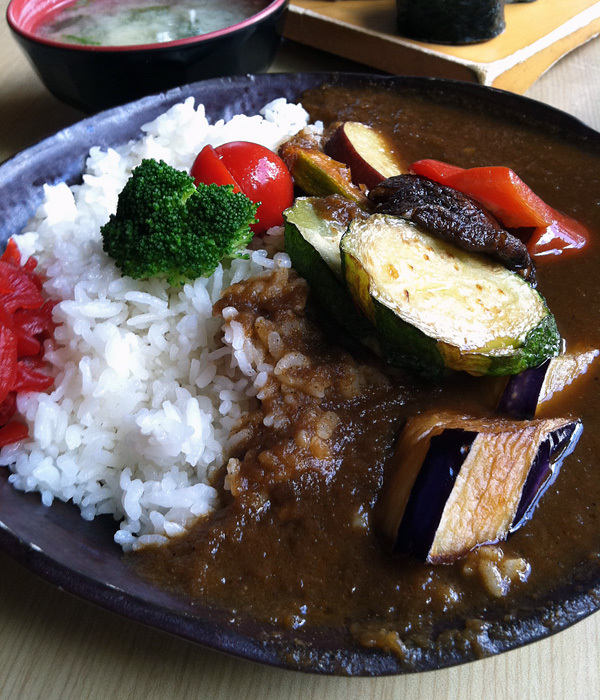 Plus it comes on a fabulous handmade plate that I want very badly, almost as badly as I want more curry. 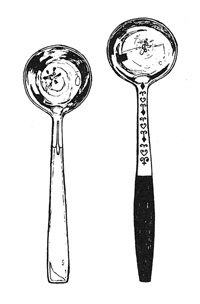 The plates came from LA a very long time ago, and I've searched for something similar to no avail. So the only thing I can do is to keep going back to Kisaku. 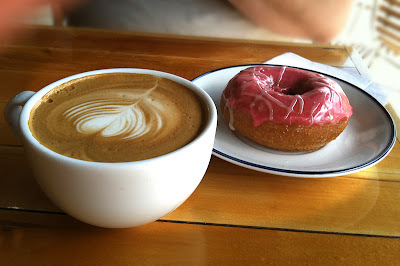 Wouldn't you know it, Kisaku is right across the street from Mighty-O doughnuts, Seattle's premier vegan doughnut shop. The day these pictures were taken, I was with Bethany, and she needed a mighty-O fix. I was too stuffed with curry to have more than a tiny little mini-doughnut — not very photogenic — but I was happy to photograph her plate. Full disclosure: I purchased lunch on my own. Any restaurant reviews are totally independent and not at the request of the restaurant. All opinions are my own. Two years ago around this time we attended a vegan holiday cooking class at PCC Natural Markets, and this year we did the same. It actually wasn't our first choice, but was the only class with openings. I like to discover new dishes for our holiday table, but I've learned that some of my guests are disappointed if the foods they expect to see are altered or replaced. For example, after the last holiday class, I made a new version of cranberry sauce that I thought was amazing, and was told that my usual sauce is better. 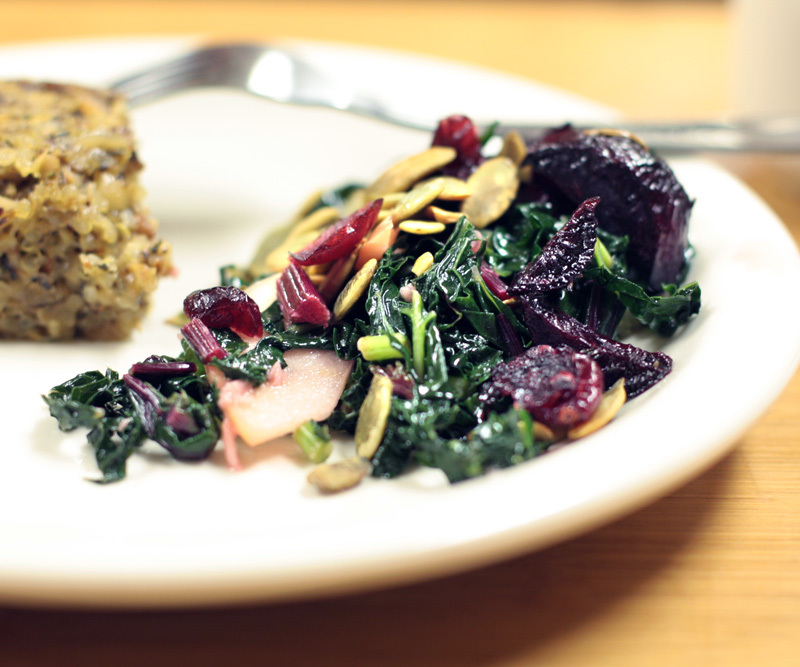 So much for upping the holiday dinner stakes, and making changes to the traditional menu. We enjoyed all the food we had in class, but I'll have to think twice about whether or not it will appear at our Thanksgiving table. We started with a fiery pear salad with caramelized spiced nuts (photo above). Something like this would be no problem introducing to my guests, but the dressing was way too much trouble to make, in my opinion, and too oily. 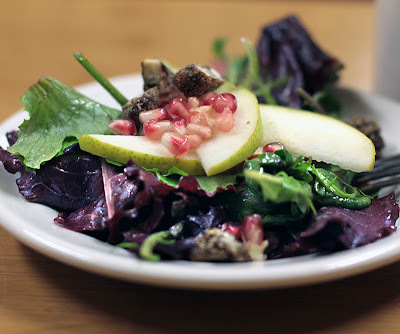 The salad mix, though, with its mix of various greens, pears and pomegranate seeds, would be a perfect starter. I doubt I'd hear any complaints, and I could concoct my own dressing. We had a wild mushroom and hazelnut paté which was very tasty, and which I might use on another occasion, or perhaps as an hors d'oeuvres for Thanksgiving. The paté was accompanied by wilted seasonal greens with roasted beets, and I can definitely see using this as our vegetable — if I can get past the roasted veggies we normally serve — and I doubt that I can. But I may incorporate some of the ingredients, like dried cranberries, apples and pumpkin seeds into our usual veggie mix. The dessert, gingered and cider-caramelized apple pie was a big hit with my husband, who admired the very flaky crust. The crust was made with spelt flour and a lot of coconut oil, and though it was indeed flaky, I felt like I was too aware of the fat content as I ate it. I don't mean the idea of too much fat, I mean the sensation I get when I eat a high fat food — I don't like the taste. All of the food was very beautiful and would make a lovely meal, but there's something about tradition that makes holidays special. Do you serve new foods at holiday dinners, or are you steeped in the tradition of what your family usually expects on special occasions? We just spent a long weekend traveling to Pennsylvania to visit relatives and friends. I only had Internet on my phone, and I hate reading and responding to blogs on the small phone screen, especially during mofo when there are so many posts it's hard to keep up anyway, so I took a little break from the blog world to concentrate on people I don't get to see very often. It was an intense few days of conversations, food and traveling — and worrying about our dog, which I'll tell you about later. This week my theme is reviews of books and restaurants, and although I thought I'd have a book review today, something happened over the weekend that still has me distracted, and I didn't get around to it. 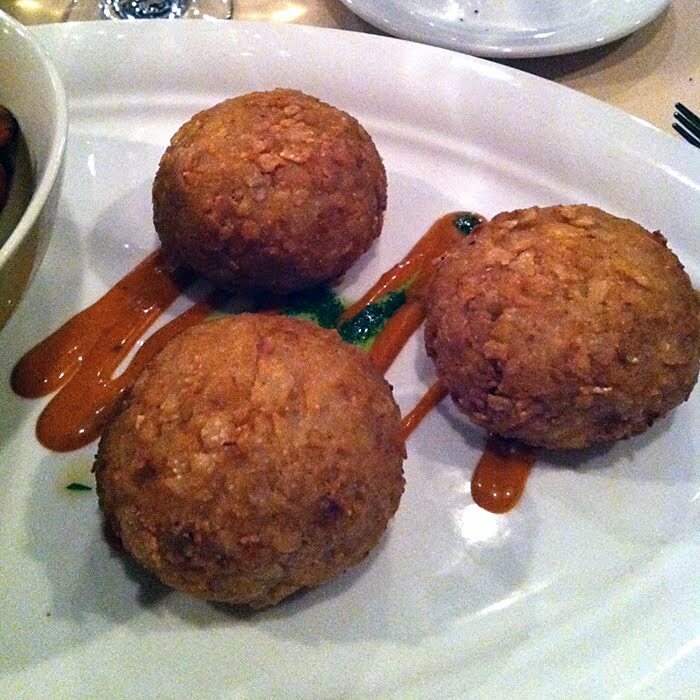 So instead, here's a little review of two restaurants we visited in the Philadelphia area. 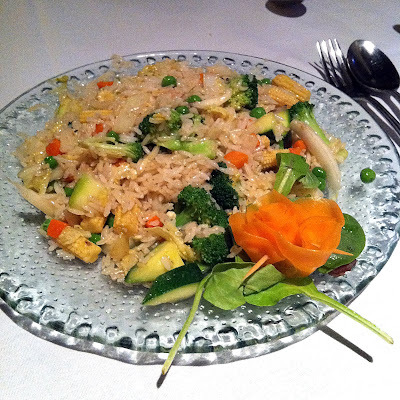 Blue Sage Vegetarian Grille is located at 772 Second Street Pike, Southampton PA. 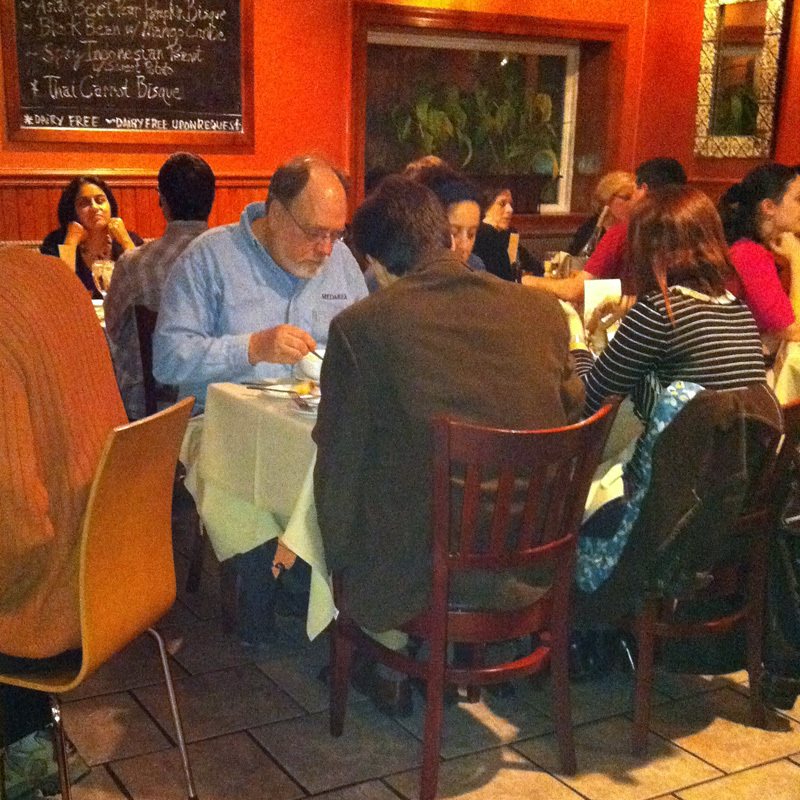 It's an charming, intimate restaurant that is very popular. So popular, in fact, that although we had a reservation for 8:00 p.m., we didn't get seated until almost 9. The people seated at the table we were scheduled to occupy, chose to linger and converse after their meal. Fine. I felt bad that they wouldn't have a chance to stay as long as they wished, but it wasn't so great standing in the crowded entryway, either, and we were wishing they would leave. About a half hour after paying their bill, the hostess told them there were people waiting for the table, and very miffed indeed, they vacated the premises. My husband started his meal with a house salad, and I don't think he expected a salad the size of the one he received. It was full of all sorts of goodies like spring mix, sweet balsamic or chile lime, pepitas, sunflower seeds and sun-dried berries. It was very fresh and delicious. 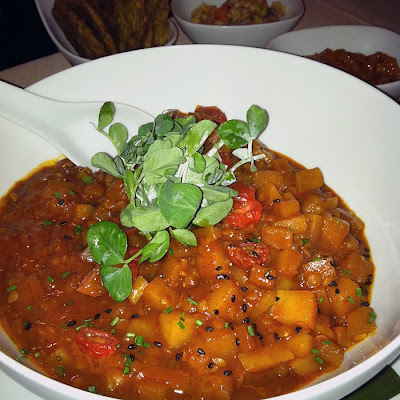 This was followed by an Indian-inspired khorma of red lentils, butternut squash and leeks in a mild house curry. 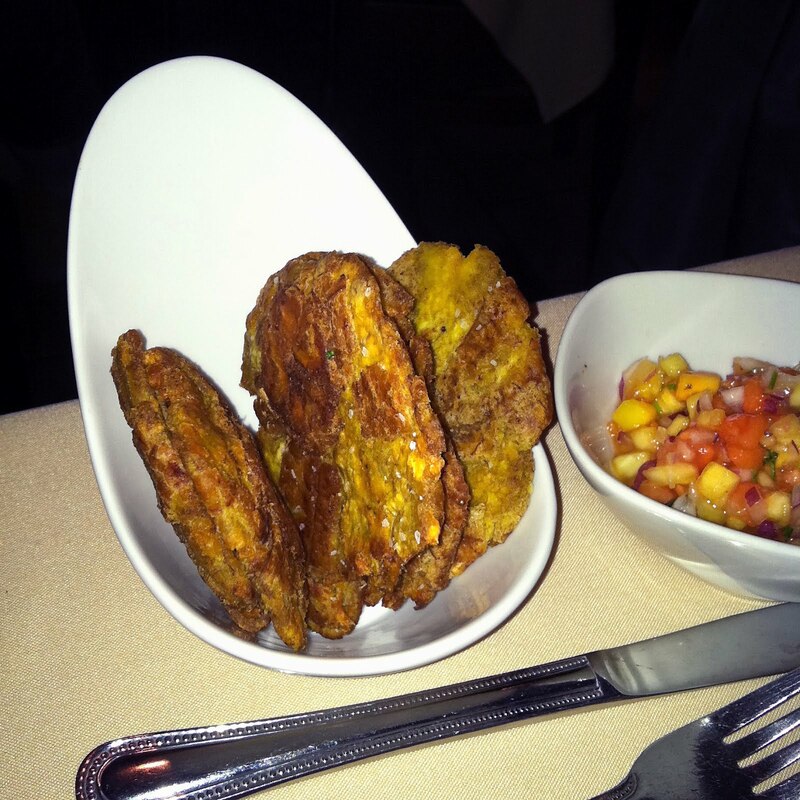 The korma was accompanied by bowls containing plantain fritters & fresh mango-papaya relish. There was a third bowl as well but I don't remember what was in it. My husband was thrilled with the korma, and there was so much that he had half of it left over. He never has leftovers. You can see the fritters and salsa at the top of the page. I can't remember the name or description of what I, and two other diners had, and it's not listed on the Web menu, so I'll try my best to describe it. 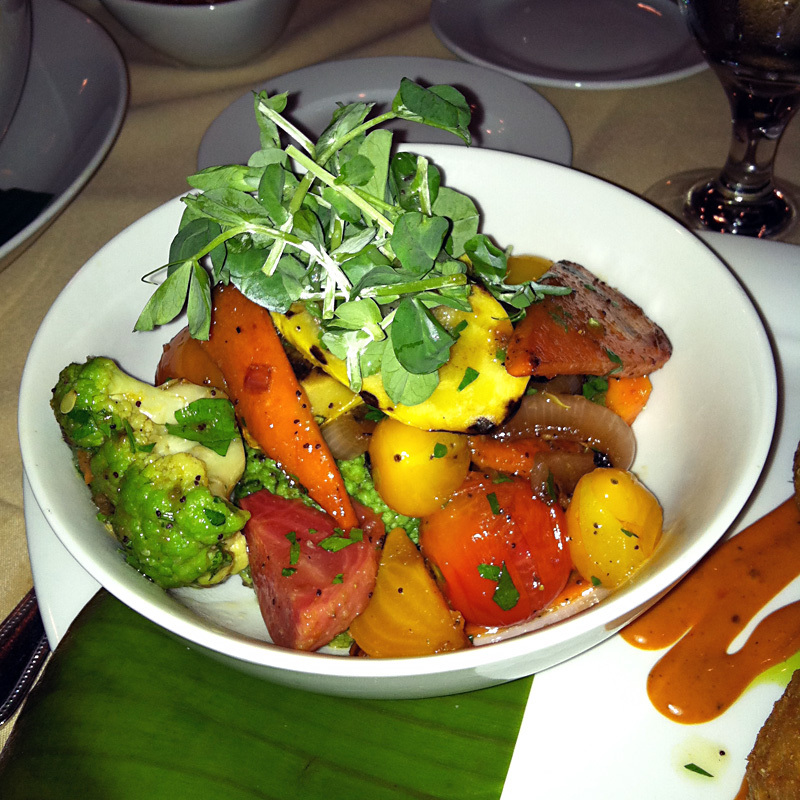 There was a generous bowl of flash-cooked vegetables that were just wonderful. They were in a balsamic sauce and were beautifully crisp-tender. On the plate next to the vegetables were three large balls made of chopped celariac and other stuff, including Old Bay seasoning. I believe they were (cough, cough) deep fried. While I, myself never deep fry anything, I will eat such food if I'm served it, though not very often. I guess I didn't realize they were deep fried until I saw them. They were good but not great. The next day though, the leftovers tasted wonderful — much better than at the restaurant. Blue Sage is a vegetarian restaurant with a large selection of vegan options. Some offerings are always vegan, and some things can be made vegan. The food presentation is lovely and the food well prepared and interesting. It's a little pricy, but not outrageous considering the quality and quantity. Never go there without a reservation as it's a wildly popular place. 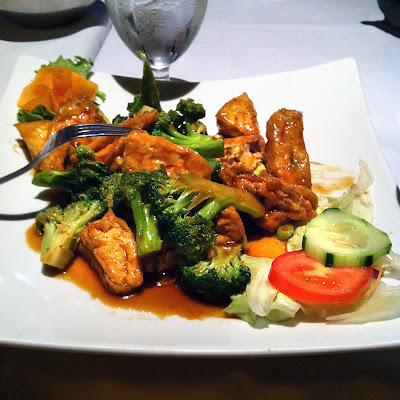 The next night we went to Wild Ginger, an Asian restaurant with a vegan menu located at 1928 County Line Rd (at Davisville Rd in Justa Farm Shopping Ctr) Huntingdon Valley, PA. They have Chinese, Thai and Japanese food, and although they bill themselves as a vegetarian restaurant, they seem to have non-vegetarian food as well. It was pretty dark in there and I only photographed some of the dishes. Above you see my fresh broccoli and tofu with ginger, which I very much enjoyed. My sister-in-law ordered fried rice, and she said it was really great. Another popular dish at our table was Buddha's delight, but my photos were too grainy and dark. It looked really good in person, though! That sums up our dining while in Philadelphia, but we had some interesting food experiences while traveling, too. On the way there, we had tight connections and barely enough time to make our connecting flight, but on the way home we had a lot of time to hang out at the Detroit airport, so we went to the Delta Club, which my frequent-traveler husband belongs to. The club is a great alternative to the airport waiting areas as it has much more comfortable and private seating, nice bathrooms and free food. Usually, the food isn't much of a draw since there's so little we want to eat, but this time things were different. There were little packets of hummus, a huge bowl filled with olives, artichoke hearts and peppers, and a big platter of celery and carrot sticks. They must have heard we were coming. The rooms were decorated with pots of what looked like grass (see above) and I wondered if they were expecting a lot of traveling cats, but when I went up close to one of the pots, I discovered the grass was plastic! After our tea and hors d'oeuvres at the club, we went to the Japanese restaurant in the terminal and had edamame and sushi for dinner. 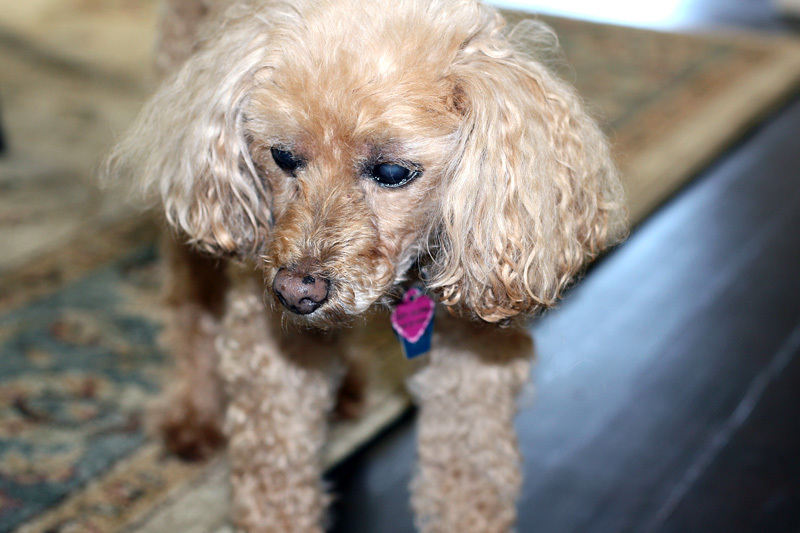 We left our elderly dog at the home of someone who does dog care. She's been there before and seemed to like it. We left her Thursday night and called Friday night to check on her, and all was not well. Our poor little dog, minding her own business, was attacked by one of the other dogs, who gave her several puncture wounds. She was rushed to the emergency clinic where they said one of the punctures near her shoulder had penetrated her muscle, and she required a lot of stitches. The wound impacted her ability to walk, and when we picked her up Monday night, she was still stumbling. It was heart-breaking to see how sad she was. She's 19, and was previously doing really well for her age, but we'll have to see if she can recover from this. 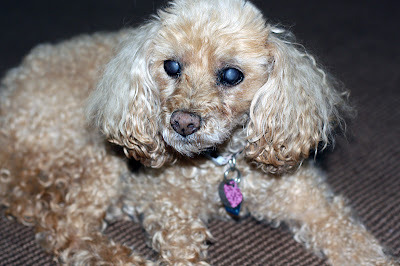 She's doing better today, so I'm hopeful she'll continue to improve. We'll see. In other news, today is my birthday! 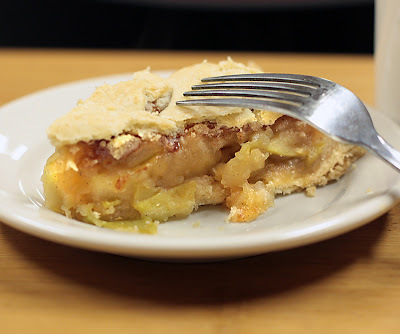 On our multiple treks from Washington State to Wisconsin, and back, we spend the night in a number of small towns and cities, usually chosen for the dual reasons of timing, and access to restaurants that might provide a vegan dinner for our road-weary selves. We've made the trip so many times, first to visit our kids, and now because we live in Seattle most of the year, that I pretty much know at which restaurants we've eaten in every town on our route. Except for Sioux Falls. Although we've stopped there often, I can't remember a single place we've eaten — sorry Sioux Falls — except for one. Last summer we pulled into Sioux Falls rather late, and exhausted. 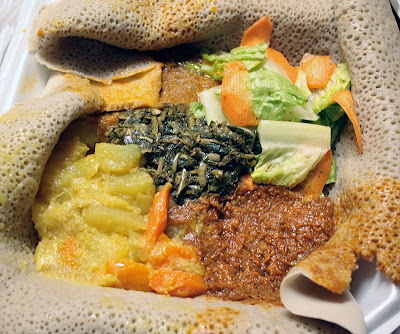 I was scouring a restaurant guide for possibilities when I came upon an Ethiopian place we'd never noticed before. We needed takeout because we were traveling with our elderly dog, and couldn't leave her alone in the hotel. It was nearly 8:30 p.m. when my husband called to see if they were open and if they had anything vegan. Be here in 20 minutes he was told. OK. He did as he was told. He returned with two large containers of the best Ethiopian food I've ever had. We were grinning from ear to ear as we stuffed ourselves with spicy veggies, and lentils, wrapped in injera. There was so much food, including extra injera, we had lots left over to store in the fridge and warm up for breakfast. I had kind of a strange dream the other night. I had just been hired to work in a daycare center where parents left their kids while they worked or shopped at the mall. The odd thing was the kids were high school-aged students, not pre-schoolers. The students were well dressed and attractive, and were from various expensive prep schools, and they were not very amenable to following directions from the teachers. At one point I noticed the students going to the school kitchen and getting food, though a scheduled meal was not being served. I went to ask the other teacher, who happened to be Antonio Banderas, if that was OK, and saw that he seemed kind of harassed, and was rolling beans into tortillas, making burritos to serve the students. I couldn't help but notice that the beans he was using were from the same chili recipe my husband and I had just made from The Happy Herbivore cookbook. It was awkward asking him stupid procedural questions because, um, he was Antonio Bandaras. 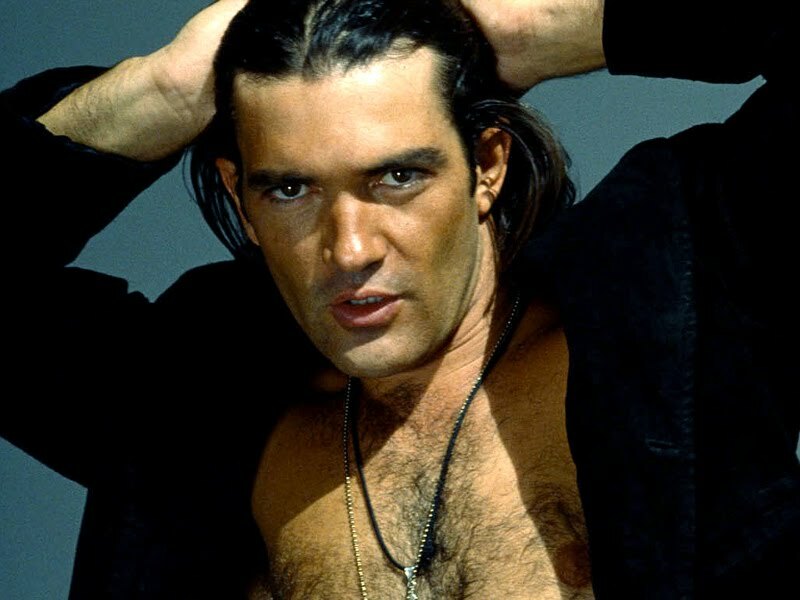 He LOOKED like Antonio Bandaras, and SOUNDED like Antonio Bandaras so, as you can imagine, it was quite distracting. He was very nice, but so busy rolling the burritos he didn't really have time to chat, and seeing as I was pretty flustered anyway, I didn't try to make conversation. That's all I remember about the dream — or at least all I'm willing to tell you —so let's just talk about the cookbook. To be honest, I've had a hard time writing a review of the cookbook because when I first received it from the publisher, we tried a few recipes and didn't like them. Go figure. I know there will always be recipes in a cookbook that don't appeal to me, so after taking a little break from the cookbook, we tried again. 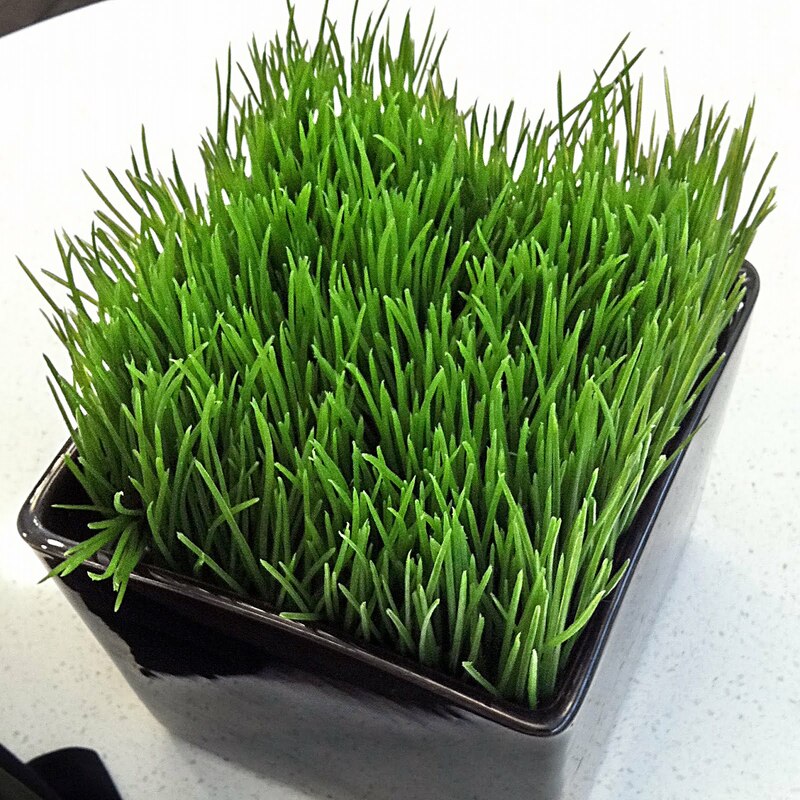 So many bloggers are cooking from The Happy Herbivore and loving it, I had to give it another shot. We made the Chili sans Carne and it was delicious. (And as you can see, it might inspire great dreams!) The chili seems pretty typical of the kind of recipes you'll find in the book — familiar, easy-to-prepare vegan comfort food — but without added fat, except for the fat that may be contained in prepared ingredients like Thai chili sauce or ... chocolate chips. Lindsay Nixon aims to provide delicious, healthy, low-fat foods that don't remind you with every bite that your dinner is healthy and low in fat. When I made the chocolate zucchini muffins, I was really worried about how they would turn out, with no added fat except for a few chocolate chips. They were excellent — moist and tender. I served them for dessert, and everyone who ate one loved it. Although I don't cook fat-free, I generally cook relatively low-fat, low-sugar and low-salt foods, and though the muffins had no added fat, they did call for a range of 1/2 to 1 cup of sugar. 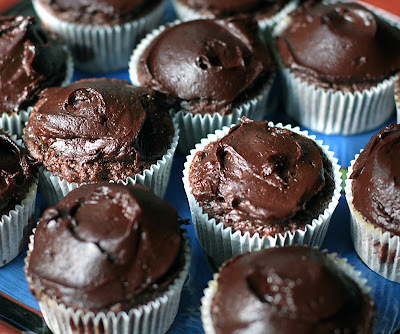 While I usually use 1/4 cup of sugar for muffins, for these I used 1/2 cup, to stay true to the recipe. (Sometimes no-fat recipes tend to have more sugar and salt to compensate for the flavor and texture fat usually adds, but in general, this doesn't seem to be the case with The Happy Herbivore.) Because the muffins were so low in fat, I decided to continue the healthy theme and frost them with a version of sweet potato frosting, that I originally found on Diet Dessert and Dogs. Trust me, you can't tell this fudge-y frosting is sweet potato-based, and it makes me feel a little healthier knowing I'm not eating big mouthfuls of margarine and powdered sugar. The other little change I made was to use whole spelt flour instead of wheat. 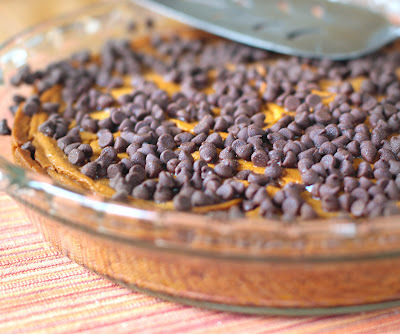 The last recipe I tried was a pumpkin pie that makes its own crust. I love pumpkin pie a lot, and I still like my old version better, but this one was quite good, and my guests really loved it. I sprinkled it with chocolate chips for a little extra pizazz. With Thanksgiving just around the corner, this might be a recipe to keep in mind. It's a much lower-fat interpretation of pumpkin pie that the usual crusted version, and I'll probably make it again for Thanksgiving. In addition to low-fat renditions of all your favorite dishes, Lindsay offers a whole selection of interesting condiments and spice mixes (Berberé, Cajun essence, vegan Worcestershire sauce, etc.) to add flavor and excitement to food. Anyone wishing to reduce their fat consumption might enjoy this cookbook, but I think it would be an especially good resource for new vegans looking to create healthier meals while still enjoying old favorites. I tend to cook with very little fat, and sometimes cook with no added fat, but I'm not by any means fat-free. We're bombarded with so much information, research, and expert opinions about what we should or shouldn't eat, it can get truly confusing. Is coconut oil a panacea or a highly saturated fat to avoid? Is olive oil a health-giving fat or just an unnecessary fat? Should we avoid sunflower oil, safflower oil, grapeseed oil? What about margarine like Earth Balance? Should we be cooking fat-free or is it OK to sauté veggies in 2 teaspoons of oil? What do you think? Disclaimer: The book was sent to me free of charge by the publisher. I was under no obligation to review it, or to write a favorable review. For reasons unknown to me, I was not offered payment in exchange for writing a review. Now calm down vegans, vegetarians and squeamish omnivores. 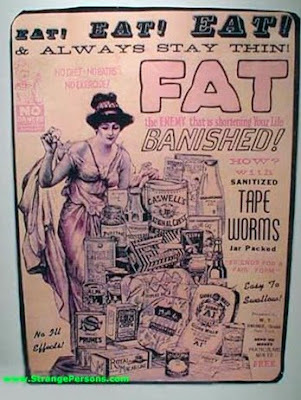 According to snopes.com, a product such as this may have been available from around 1900 to 1920, but there's no substantial proof that the product actually contained tapeworms. It may have been just another fraudulent product marketed to susceptible people as a scam. It's not certain if anyone has ever tried to lose weight by swallowing a tapeworm. The person most associated with the possibility was opera singer Maria Callas, who was known to suffer from tapeworm, and also to struggle with weight issues. 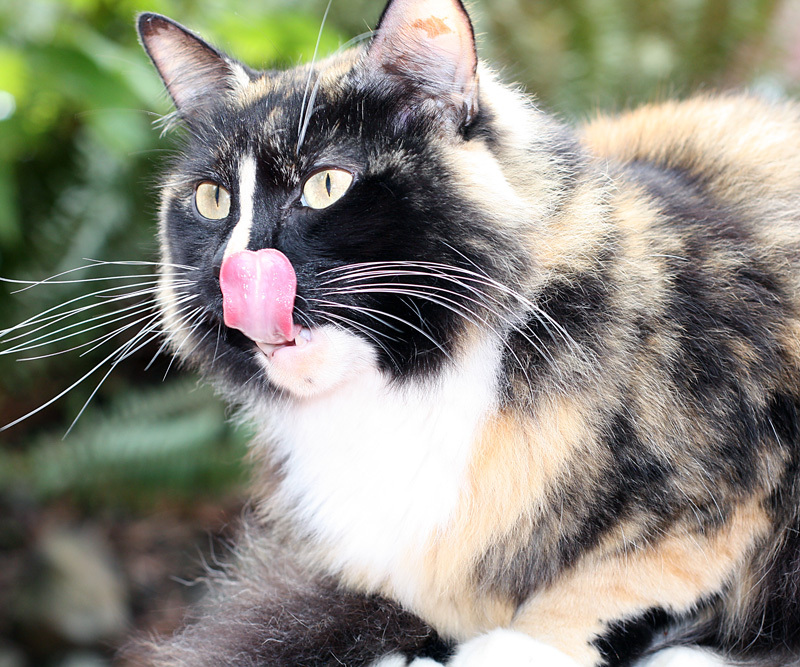 However, it's generally believed she acquired her tapeworm from her habit of eating raw meat. Aren't you glad you're vegan? Thus ends week 2 of VeganMoFo 2011. Next week I'll be seriously reviewing cookbooks and restaurants. Have a great weekend! I'm on my way to the East Coast. Why didn't anyone tell me about this when I was nursing my babies? 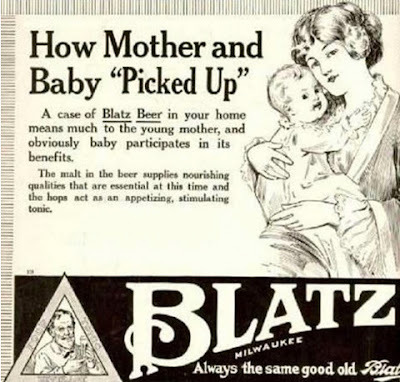 I can't believe I missed out on all the "nourishing qualities" of this "appetizing, stimulating tonic." 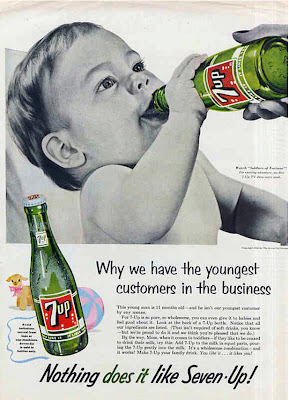 I guess My kids and I were born too late to reap the benefits of this advertising advice. Just as well, I guess, since most advertisers don't really have your good health in mind, even as they suggest health benefits related to their advertised products. As we can see here. 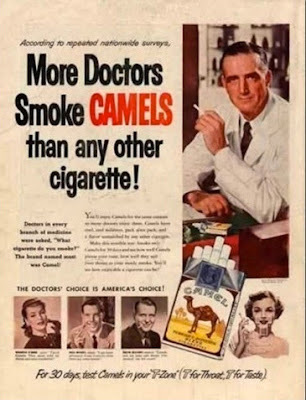 I wonder how the health-conscious ads of today will hold up to future scrutiny. 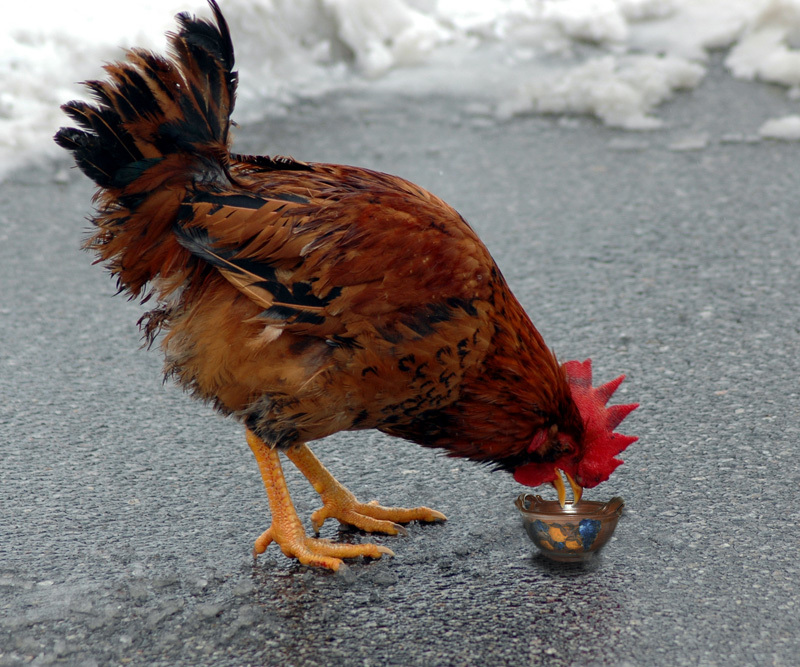 What is chicken soup and why is it so funny? When my oldest son was four or five, he learned for the first time about chicken soup. Laughing hysterically, he told me that so-and-so had eaten chicken soup. "Can you believe that, Mom? He ate chicken soup." He found the idea of eating chicken soup hilarious, and I had to wonder, why was my vegan child, who knew perfectly well that we didn't eat chickens, so amused at the idea of others eating them. He ran off into another room to play, and I scratched my head. Aha! I called him back. "What is chicken soup?" I asked. He looked at me gleefully and said with giggles, "Soup that chickens eat!" Labels: vegan humor, VeganMoFo 2011, what is chicken soup? Seriously, there's a lot of discussion about whether or not a well-balanced diet provides enough vitamins and minerals without the need for supplements. Vegan diets, especially, are subject to scrutiny. After much reading and research, I made the decision long ago to take vitamins. I take a vegan multivitamin and mineral tablet without iron, vitamin D2 tablet, and calcium tablets, which also contain C, D2, K, MK-7, magnesium, zinc, copper, manganese, potassium, boron. Every two or three days I take a methyl B-12 chewable tablet. Occasionally I get inspired by something I've read to take something else like silica or CoQ10, but usually I give it up fairly quickly and just go back to my standard regimen. Do you take supplements? Here's a new report on research concerning multivitamins and increased mortality in older women. It's sure hard to know what research to trust and what the best plan is. 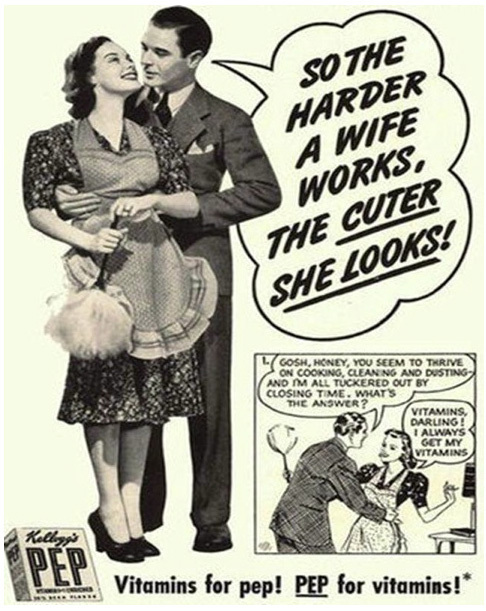 Pure pleasure, 50s style —What were they thinking? This young man is 11 months old—and he isn't our youngest customer by any means. For 7-Up is so pure, so wholesome you can even give it to babies and feel good about it. Look at the back of a 7-Up bottle. Notice that all our ingredients are listed. That isn't required of soft drinks, you know—but we're proud to do it and we think you're pleased that we do. 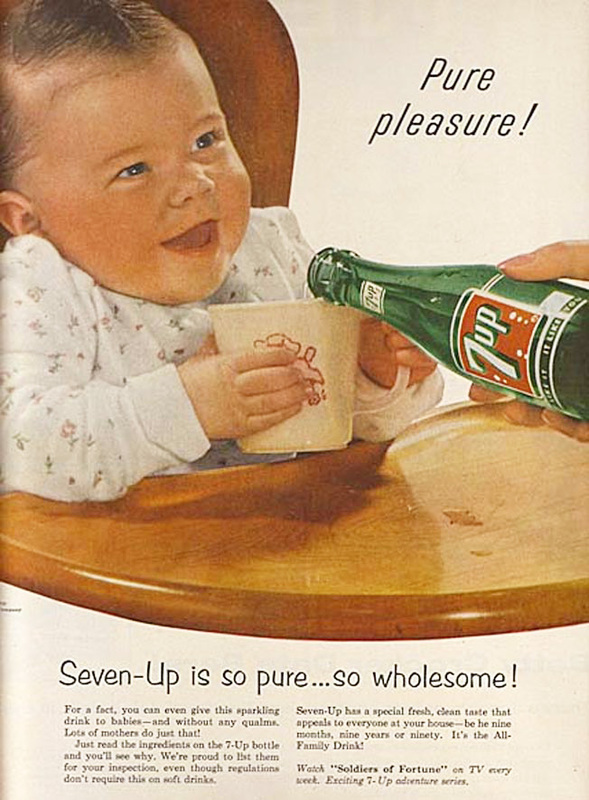 By the way Mom, when it comes to toddlers—if they like to be coaxed to drink their milk, try this. Add 7-Up to the milk in equal parts, pouring the 7-Up gently into the milk. It's a wholesome combination—and it works! I just want to say, please, vegan parents, use non-dairy milk. Did people really do this? 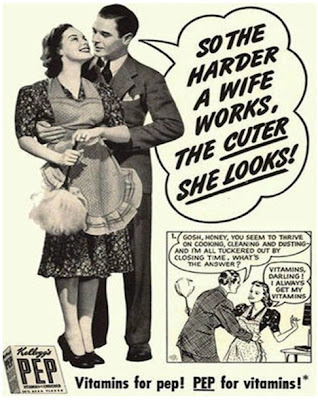 Can you imagine what would happen if an add like this were to appear today? What's in your slow cooker?